Throughout Canada, the climate results in frost damage to buildings, roads, and equipment every winter. Smaller buildings and roads are particularly affected by ground movements due to frost heave. As the ground freezes, water is drawn from the lower unfrozen soil to the frost front where it freezes forming a series of ice lenses as the frost penetrates the ground. In the change from liquid to solid, water expands 9% in volume. Fine grained soils, particularly silty soils are frost susceptible, as their pore structure allows the capillary movement of water but is fine enough to support ice lensing. Clays impede water flow and so the development of ice lenses is retarded. A sandy soil will allow frost to penetrate deeper than a clayey or silty soil. Annual frost penetration depth at any location is determined by the balance between the supply of heat from the interior of the earth(latent heat) or the structure and the rate at which it is lost to the atmosphere. Elimination of any one of these factors will eliminate frost heave for all practical purposes. Therefore, frost heaving can be avoided by removing one of the 3 factors necessary for its foundation. 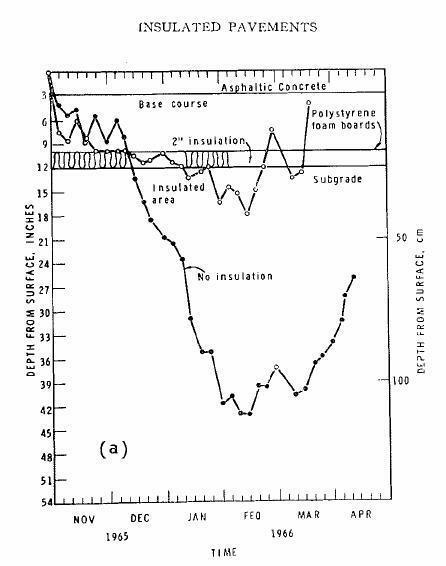 The most economical method to prevent frost heave is insulation (Styrofoam by Dow Chemical), The insulation retards geothemal heat loss in the earth, thereby reducing the depth of frost penetration. The insulation layer should be buried at a sufficient depth to prevent its damage by traffic and to protect it against chemical deterioration under sunlight. Generally 200mm to 300mm of fill or fill plus pavement is considered adequate protection. For heated structures, it is advantageous to maintain the floor slab as low as possible relative to the outside grade, this will permit maximum flow of heat to occur from within the building to the soil beneath the foundations. In unheated structures, a continuous insulation mat must be provided beneath the entire area of both floor and footings.The insulation required is significantly reduced if clean, nonfrost susceptible fill is provided beneath the floor. Even though the nonfrost susceptible fill may freeze, ice lenses will not develop,and consequently, frost heave will be within generally acceptable limits.